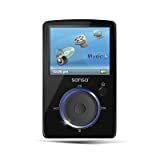 SanDisk Sansa Fuze 4 GB and 8 GB Video MP3 Player with huge discount! Tiny, easy, capable and now even more affordable than ever with 31% (4 GB version) and 43% (8 GB version) off regular price! With the SanDisk Sansa Fuze , you can fuse your portable entertainment, featuring 8 GB of storage. Listen, watch, and play all day with 24 hours of battery life and room for up to 2,000 songs**. Watch your favorite video clips on the Sansa Fuze’s 1.9-inch color screen. Measuring just 0.3 inches thin, the Sansa Fuze marks the next wave of music and video players. The SanDisk Sansa Fuze player supports MPEG4 video files and audio files saved in MP3, secure and unsecured WMA, WAV, Audible, and Overdrive file formats. With an option to extend the capacity, the SanDisk Sansa Fuze sports a MicroSD/SDHC memory card slot that means storage possibilities are essentially unlimited. Expand your music collection, show albums of photos up to 4000 images*, and watch your favorite videos on those long trips. FM Radio: If you’re feeling like a break from your own tunes, or want to dial in the TV frequency at the gym, use the digital FM tuner. Save your favorites on the 40 user presets. Voice Recorder: Use the voice recorder with built-in microphone to take memos, record meetings or lectures, or capture whatever else you might feel inclined to point a microphone at. When you’re ready, transfer your files for listening on your PC. 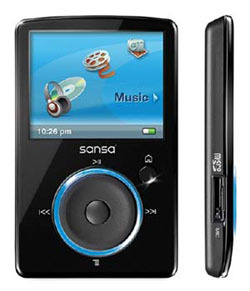 The SanDisk Sansa Fuze 8 GB Video MP3 Player goes for US $67.89, the 4 GB retails for US $55.14! Even if you never used a vinyl album, barely remember VHS cassette or never troubled with audio compact cassettes, you may fall in love with these (now ancient media) and want to convert them to MP3 or whatever. Or you may have tons of valuable albums and want to preserve that sound for eternity (or something like that). ION has created a revolutionary USB dual cassette deck allowing you to convert your cassette collection to CD or MP3 with included recording software. (no special drivers needed). Ion Tape2PC comes bundled with EZ Tape Converter by MixMeister, which converts your audio cassette recordings directly into iTunes. In just a few mouse clicks, you’ll be up and running with digital versions of your tapes. Audio-Technica makes it easier than ever to transfer your albums to the digital realm with this new Audio Technica AT-LP2DUSB LP-to-Digital Recording System with USB . The AT-LP2D-USB stereo turntable comes equipped with a USB output that allows direct connection to your computer. The system also offers: state-of-the-art recording software¿Cakewalk PYRO (for PC use) and Audacity (for MAC or PC); an integral dual-magnet Audio-Technica phono cartridge; and a USB cable and adapter cables. The turntable also features a built-in switchable phono/line preamp that allows connection to a stereo system equipped with either a phono or line-level input. VCR 2 PC’s transfer technology saves home movies, family videos, and personal tapes directly to a PC. Imagine never having to dig for tapes again or worry if they will work. Once you save your precious memories to your computer, they will be saved forever in pristine digital format. Included EZ VHS Converter software can even export your video in MPEG4 format for compatibility with select mobile phones and portable multimedia devices! is the perfect VHS player for any room in the house. Included software lets you burn your home movies to DVD, watch on your PSP, iPod or laptop computer. Player Features RCA audio/video inputs to archive from external sources like video cameras Composite video output and audio line output Auto tracking, variable speed slow-motion, playback, and rewind Soft-touch backlit buttons PAL version features SCART output Software. Kingston introduce a new gadget aimed at computer and camera users on the move, offering a diminutive all-in-one device that will allow you to store, transfer and read files between your PC and memory cards. The Kingston, DTCR/2GB, Flash Reader, USB Flash Drive looks just like a standard USB Flash drive, but flip the cover and you will disclose a cleverly hidden expansion slot that doubles as a card reader, compatible with the SD, SDHC, MMC, MMCplus formats (miniSD, microSD, RS-MMC, MMCmobile and MMCmicro cards can also be read when using an optional adapter). 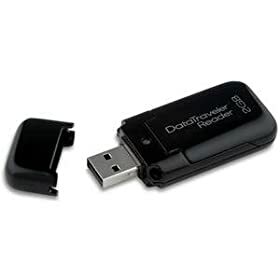 The DataTraveler comes in two sizes, 1GB and 2GB , weighs only 0.528 oz (15g) and is ideal if you wish to minimize the amount of devices to carry when on the move, ensuring compatibility with all PCs and Mac and all cameras using compatible memory cards. You are currently browsing the archives for the Memory Card Reader category.